Which hosting package should I be on? It’s a question we get asked on a regular basis. In this blog, we’ll break down hosting and hopefully help you decide on which package to go for. Q. What is disk space? A. Disk space is the allocated amount of storage space your account has on the hosting server. This is a quota – similar to how many calls/texts you would get on a mobile phone contract. However, this quota is not reset monthly – it’s your total for the duration of your hosting account use. A. Bandwidth is a quota of how much data transfer can be performed between the server (your website) and user (visitors to your website). Thus, if you’re expecting an extremely busy site, it would be best to have a higher quota. .
Our standard hosting is the first package in our range. It comes with 300mb of disk space (0.3GB) and 6GB of Bandwidth. Q. So who is the Standard Hosting suited to? A. The short answer is probably anyone who is thinking of starting a hobby/personal website. Probably a site which won’t be using many images – as images are normally the culprit for eating up disk space. Our plus hosting is the next package up in our range, the step beyond our Standard hosting. Up until 2015, we only had 3 packages but after listening to customer feedback, the demand was high for a package to bridge the gap between our standard and business hosting. The Plus account sees a fairly big jump in allocations – 1GB of disk space and 20GB of Bandwidth. Q. So who is the Plus Hosting suited to? A. The Plus hosting is probably ideal for anyone who is in the early stages of setting up their own business. Perfect for individual projects or a playground for entrepreneurs, developing ideas into businesses – at which point, we’d recommend the business hosting account.There’s plenty of room for a holding webpage (until the website is built and developed) along with a decent amount of space for emailing needs. Our business hosting is the 3rd package in our range of hosting. The package comes with a great amount of space for employee emails as well as your business website. The disk space is 5x that of the plus account; a massive 5GB. The bandwidth allocation is 50GB per calendar month. Q. So who is the Business Hosting suited to? A. The business account is best suited to… businesses. Perfect for businesses and other high performing websites. Our professional hosting is the final package in our range of hosting.This package is our best value package and comes with a massive 10GB disk space and 100GB of bandwidth. Q. So who is the Professional Hosting suited to? A. The professional hosting is best suited to high performing websites or those who wish to run web based applications. The package is also ideal for larger businesses with bigger teams of employees. There you have it, a full breakdown of the hosting packages. 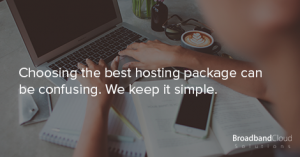 Ready to order your perfect hosting package? Click here and take the first step.